Assureon® is an archive storage solution ideally suited for optimizing storage, regulatory and corporate compliance, as well as long-term archiving. Regulatory & Corporate Compliance – adhere to governmental regulations including HIPPA, SOX and SEC-17. Enforce corporate policies concerning privacy, protection and data retention. Long-Term Archive – retain managed data for days or decades while providing unmatched integrity and protection in a system that is easy to administer and abides on-premise, in the cloud, or both. Assureon offers a strong return on investment (ROI). It can unload more costly primary storage to free up availability for active data. Assureon reduces the volume of data in monthly full backups, allowing companies to save personnel, money and time. All Assureons whether remote or local, are manageable from a web browser within a single computer screen. With the web-based GUI it is simple to create retention parameters and associate them with folders and files. After installation and configuration onto the Windows Servers, the Assureon Windows Client can then move copies or files onto the Assureon, trailing a small shortcut file behind. Hyper speed restoration is available, employing the shortcuts. Another capability of Assureon is the Assureon Edge which is an appliance that offers CIFS/NFS files to Windows and UNIX/Linux environments. The Assureon Edge then stores all shares on the Assureon. All files have the option to be encrypted with AES-256. The built-in key manager safeguards all keys safely storing them in 3 locations worldwide. 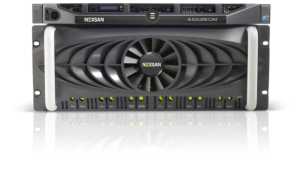 Nexsan’s single point deletion technology allows Assureon to effectively delete all stored copies of a file by destroying the file’s encryption key. Users are authenticated using Active Directory or with digital certificates ensuring they can only access files for which they are authorized. Audit trails show user’s activities such as file acceptance and denials. Legal hold is easily placed on any set of files, overriding their initial retention periods. Users have no need to alter how they work–archiving is transparent to them. Files and folders appear to be in the same location even though they have been offloaded, thanks to the pointer files that are left behind. Once archived, previous versions are available with a right mouse click in Windows Explorer. A simple web-based GUI makes searches easy of the complete archive with role-based restrictions. Existing applications remain unchanged with Assureon as there are no special APIs required. When a file is saved, it receives a fingerprint so its history and data cannot be changed post hoc. This write-once, read many time (WORM) storage instrument is part of how Assureon meets strict regulatory requirements including HIPPA, SOX and SEC17. Dual copies of all files, including their fingerprints, are saved on separate RAID disk sets. Two Assureon appliances can be replicated to each other to protect against a possible site failure. Files are constantly validated against their fingerprint, repaired with their copies and protected by RAID disk arrays, for days, years or even decades. Native active/active replication safeguards against site disasters using automatic failover while offering superior performance over active/passive systems. Assureon accepts both compliant and non-compliant policies concurrently while competitors require more than one system to be purchased in order to offer both. Files can be AES-256 encrypted. The keys are safeguarded at 3 sites with the integrated key management service. Multi-tenancy features permit service providers to offer archiving as a service. This also permits large organizations to attain strict separation of departments or projects. An on-site Assureon can replicate data to a cloud-based archiving service, which is powered by Assureon.